moment. The Roku for Netflix is so simple and easy to use, we could only play for a few minutes and we were watching a movie. To start, we have to understand why it is important for a company that rents videos to be selling boxes for members to instantly watch videos on their televisions. Currently, Netflix has 8 million subscribers, 21% more than last year. The business is based on renting movies by mail, such as Bazooka does in Chile. However, as efficient as the distribution of the DVDs is, Netflix has a cost that it assumes twice per film, per customer, as the physical DVD has to travel through the US Postal Service. In addition to administrative and logistical costs of managing the inventory, the company waste is great when you consider the volume that they handled daily. That’s why companies like Netflix and Blockbuster are seeking new ways to distribute their films in a more efficient. Digital distribution is the solution. It is interesting to see how the industry has evolved: First there were neighborhood video libraries, then monopolistic chains, then the mail distribution of DVDs and now the virtual distribution. The Roku Video Player is not a media center, not a DVR, it’s no Apple TV. That’s the beauty; it offers so little and is so simple that even the price in U.S. is small, $ 99. With it, you do not buy movies, and renting is complicated by limitations of the DRM failed strategies. The Roku does only one thing: you can now see over 10 thousand movies, whenever you want, whenever you want and for as long as you want. Netflix in the future wants to add his entire library of 100 thousand movies. Inside, it has no hard drive, only 32MB of memory used by owners to manage their software and functions. One does not drop or download movies to the device, but you see content in pseudo real-time streaming, Internet Television. The ports you have are: HDMI, component, composite video, Ethernet, S-Video and a Toslink optical. It also has WiFi and runs on an Internet bandwidth from 1.5 Mbps and up. 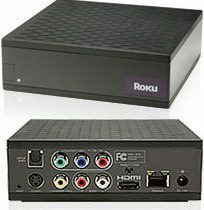 Short and fast installation: The Roku Video Player plugs into the mainstream TV plugs and into an Ethernet connection to your broadband Internet connection. You log into your computer and your Netflix account, you select the movies to watch, and begin watching movies. The Roku is only the beginning of a series of other devices that Netflix has already announced and will be available in the coming months in the U.S. The installation took less than 10 minutes. When you are ready to watch movies, it takes about 2 minutes to start, and image and sound are flawless. It’s a completely seamless experience comparable with any cable or DVD movie. If you desire to have more than 10 thousand movies available and want to watch them in great quality, buy it quickly without thinking twice. If you want advanced features you find in traditional DVDs and other advanced services, you might want to wait for a more robust solution. Excellently written editorial, if only all bloggers offered the same content as you, the net would be a much better place. keep going! Cheers.